Is that newspaper available online, Andy, or did you get it from microfilm? Genealogybank.com — a subscription service. The other big one is Newspaperarchive.com. I subscribe to both, because they cover different titles. The costs add up, and I cringe every time I get a renewal notice, but it’s a necessary expense. I like newspaperarchive and use it myself. (and say ouch during renewal as well) How much different content is in Genealogybank? I haven’t compared them side-by-side, but my sense is that there’s little overlap, except perhaps in some of the larger newspapers. I believe both companies arrange with local archives for exclusive access to digitize, so unless a given publication is archived by two or more different institutions, it’s not likely to be in both systems. My local archives turned over all their microfilm to Newspaperarchive for digitizing, in return for the company providing free access for local library cardholders. So that’s where I go for stuff local to me. On the other hand, I much prefer Genealogybank’s user interface and search tools. Their OCR is much better, as well, but they may have stricter requirements on the quality of the digitized imagery they provide — I’ve found that searching on Newspaper archive is not very reliable, and if you’re looking for material related to a specific event, it’s necessary simple to go through the appropriate papers on your own, page by page so as not to miss something that didn’t get properly OCRed. Imperfect tools, to be sure — but still beats wrestling with microfilm and spending $2 in quarters to get a single, readable page out of the printer. This is interesting Andy. Think about the context of the event as well. This article comes 10 days after Patrick Cleburne’s proposition to arm slaves to replenish Confederate ranks. Yeah, I knew it was right around the same time, but didn’t know the exact date. I wonder if this piece was written explicitly in response to murmurings about Cleburne’s proposal there in Richmond. Seems very possible, no? This is a full year before the proposition became an active and open matter of legislative discussion in the CS government. I think it’s an interesting aspect to explore and quite possibly a good magazine/blog article. It is. I was just doing a quick skim of A Rebel War Clerk’s Diary, but didn’t see any mention of rumors of Cleburne’s proposal. Then again, the date of the newspaper here is the same date on which President Davis acknowledged receipt of Cleburne’s proposal, and ordered it kept quiet. Maybe coincidence, maybe not. The timing is remarkable. Almost too good to be true. It would depend on when word of the proposal leaked, and when it made its way to Jefferson’s Cabinet in VA. Given that the Union controlled Chattanooga and Knoxville at this point in ’64, word would move pretty slow. Other documents on that site show it was forwarded to Davis from Dalton, Georgia on the 12th, and acknowledged by Davis on the 13th. That means transmitted by telegraph — that passes through a lot of eyes and ears in transit. 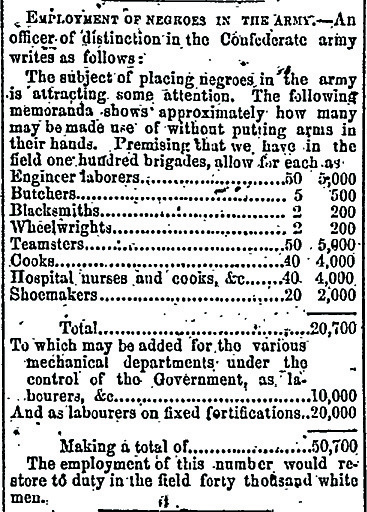 It might be connected to Cleburne, but keep in mind that you can find editorials on black enlistment going back to the beginning of the war. Rob may be right or it may simply be a coincidence. Either way, great find. As far as comparing dates it looks incredible. If this were an immediate reaction to Cleburne’s proposal, which is one of the more famous Confederate proposals to arms slaves, I think it would speak volumes about the southern position to arms blacks. Sadly it’s coincidence until proven otherwise. What it does demonstrate is: that even in this late war period when man power was needed there were still elements of the military not only hesitant to arms slaves, but opposed to their involvement in anything other than labor. Even a year-plus later, the debate was furious, and the promise of emancipation Lee thought vital had to be abandoned to get it passed. I found the documented efforts to get “40,000” Wite men back into the army very interesting. I’m talking about the attempts to get back POWs. There was the Bradley Johnson/Harry Gilmor Raid in July 1864, which included trying to get men out of Point Lookout; and then Booth’s the orignal (before assassination) plan to kidnap Lincoln and use him as ransom to get back all the POWs. When these plans didn’t work, THEN Confederates finally did what they were reluctant to do- try to enlist Black soldiers. But even then, according to Gary Gallagher, it was a self-serving attempt. Lee wanted to put a few men in the army with a promise of freedom (the CS gov’t didn’t want to promise freedom). But Lee knew they wouldn’t fight without the promise and would probably run to the Yankees. Anyway, I just think it’s so interesting that the Rebels were willing to use sick and starved White men before they were willing to use able-bodied Black men. Even so, when the CS Congress finally, formally allowed the enlistment of black troops — less that 3 weeks before the fall of Richmond and with Union guns rattling the windows of the capital — it was without the emancipation provision Lee had deemed necessary. You can’t say they didn’t have consistent priorities.